The New York Times Company has announced that BBC director general Mark Thompson is to become its chief executive and president in November. The NYT runs national and regional newspapers and websites and said his experience in digital media on a global scale made him the "ideal candidate". Mr Thompson, 55, said he was "excited" to take on the role. 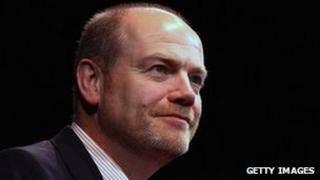 He took over as director general in 2004 and is responsible for the BBC's TV, radio and online services. He started his career as a production trainee at the BBC in 1979 before leaving in 2002 to become chief executive of Channel 4 television. At the beginning of July the BBC announced that George Entwistle would replace Mr Thompson as director general on 17 September. "Mark is a gifted executive with strong credentials whose leadership at the BBC helped it to extend its trusted brand identity into new digital products and services," said NYT chairman Arthur Sulzberger in a statement. For his part, Mr Thompson said it was a "privilege" to take on the role. "I'm particularly excited to be coming to New York Times Company as it extends its influence digitally and globally," he said. The company, which owns the New York Times, International Herald Tribune and the Boston Globe newspapers, posted revenues of $2.3bn (£1.47bn) in 2011. The company has been without a chief executive since Janet Robinson stepped down in December 2011. Following the announcement, BBC Trust Chairman Lord Patten said: "I am sure that Mark will prove a real asset to the New York Times. "He is a hugely experienced media executive and will bring insight, flair and drive to the job."